A protein-packed bowl with pearl couscous, roast veggies and a tasty Middle Eastern-spiced marinade. 2. Mix all the ingredients for the marinade in a small bowl, then rub it all over the chicken, making sure it’s well coated. Set aside. 3. Place the veggies in a roasting tray, drizzle with a teaspoon of olive oil, season with a little pink salt and pepper and mix well. Pop the reserved lime halves into the tray as well. 4. Place the chicken on top of the veggies and roast for 25–30 minutes, until the chicken has cooked through and the juices run clear. 5. While the chicken and veggies are in the oven, cook the pearl couscous according to the instructions on the packet. 6. Once the chicken is cooked, remove it from the roasting dish and leave to rest. Then return the veggies to the oven and turn up the heat to 230°C (450°F). Leave the veggies in the oven for another 8–10 minutes, or until they have nicely caramelised. 7. 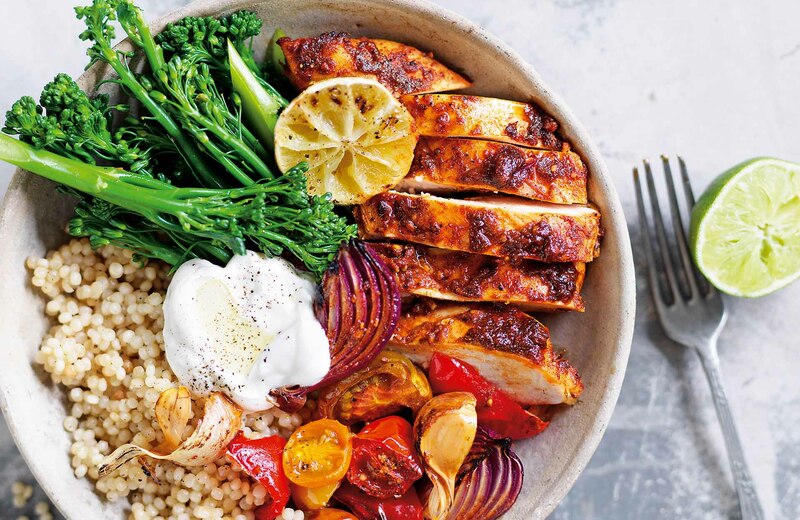 While the veggies are in the oven for the final 8–10 minutes, quickly blanch the broccolini in a bowl and cut the chicken into 1.5 cm (⅝ inch) slices. Divide the ingredients equally between two bowls. Add a dollop of yoghurt to the middle. Enjoy!